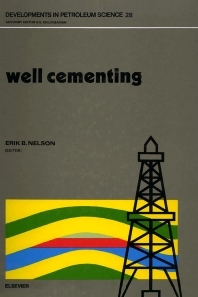 Implications of Cementing on Well Performance. Zonal Isolation. Cement-to-Pipe Bond and Hydraulic Fracturing. Chemistry and Characterization of Portland Cement. Chemical Notation. Manufacturing of Portland Cement. Hydration of the Clinker Phases. Hydration of Portland Cements - The Multicomponent System. Classification of Portland Cements. Cement Additives and Mechanisms of Action. Variability of Additive Response. Accelerators. Retarders. Extenders. Weighting Agents. Dispersants. Fluid-Loss Control Agents. Lost Circulation Prevention Agents. Miscellaneous Cement Additives. Rheology of Well Cement Slurries. Some Rheological Principles. Equipment and Experimental Procedures. Data Analysis and Rheological Models. Time-Dependent Rheological Behavior of Cement Slurries. Flow Behavior of Cement Slurries in the Wellbore Environment. Mud Removal. Displacement Efficiency. Well Preparation. Mud Displacement. Spacers and Washes. Cement Mixing. Cement/Formation Interactions. Fluid Loss - Introduction. Dynamic Fluid Loss. Cementitious Drilling Fluids. Prevention of Annular Gas Migration. Practical Consequences of Gas Migration. Physical Process of Gas Migration. Gas Migration Testing. Gas Migration Solutions. Gas Migration Prediction. Thermal Cements. High-Temperature Chemistry of Portland Cement. Class J Cement. Silica-Lime Systems. High-Alumina Cement. Deep Oil and Gas Wells. Geothermal Well Cementing. Thermal Recovery Wells. Cementing Equipment and Casing Hardware. Cementing Materials. Basic Equipment. Cementing Units. Introduction to Casing Hardware. Casing Hardware. Remedial Cementing Tools. Cement Job Design. Problem Analysis. Slurry Selection. Placement Mechanics. Well Security and Control. Computer Simulators. Example of Job Design Procedure. Preparing for the Job. Primary Cementing Techniques. Classification of Casing Strings. Cement Placement Procedures. Liners. Special Offshore Techniques. Operational Considerations. Remedial Cementing. Squeeze Cementing - Theory. Squeeze Cementing - Placement Techniques. Injection Test. Design and Preparation of the Slurry. Basic Squeeze-Job Procedures. Squeeze Cementing - Applications. Evaluation of a Squeeze Job. Reasons for Squeeze-Cementing Failures. Cement Plugs - Introduction. Plug Placement Techniques. Job-Design Considerations. Evaluation of the Job, Reasons for Failures. Plug Cementing - Conclusions. Foamed Cement. Theory. Design. Execution and Evaluation. Field Applications and Case Histories. Squeeze Cementing of Weak or Depleted Zones. Gas Channeling. Horizontal Well Cementing. Horizontal Well Classification. Horizontal Well Applications. Completion Procedures. Mud Removal. Cement Slurry Properties. Summary - Keys to Cementing Horizontal Wells. Cement Job Evaluation. Hydraulic Testing. Temperature, Nuclear and Noise Logging Measurements. Acoustic Logging Measurements. Appendices: Digest of Rheological Equations. Laboratory Testing, Evaluation, and Analysis of Well Cements. Cementing Calculations. Index. Cementing is arguably the most important operation performed on a well. Well cementing technology is an amalgam of many interdependent scientific and engineering disciplines which are essential to achieve the primary goal of well cementing - zonal isolation. This textbook is a comprehensive and up-to-date reference concerning the application of these disciplines to cementing a well. Well Cementing'' is envisioned as an upper-level university book, as well as a reference for practicing engineers and scientists. The first section of the book illustrates how the quality of the hydraulic seal provided by the cement sheath can affect well performance. The second section concentrates on the design phase of a cementing treatment, and various aspects of cement job execution are covered in the third section. The fourth section addresses cement job evaluation. The text is supported by many tables and figures, an extensive bibliography and an index. There are also chapters devoted to subjects which are currently of particular interest to the industry, including the prevention of annular gas migration, foamed cements, and cementing horizontal wellbores. The chemistry associated with well cementing is presented in detail. Most of the contributors to this volume are employees of Dowell Schlumberger, one of the leading companies in this field.